Common in Europe and increasingly here as well, entombment is an alternative to traditional inhumation. 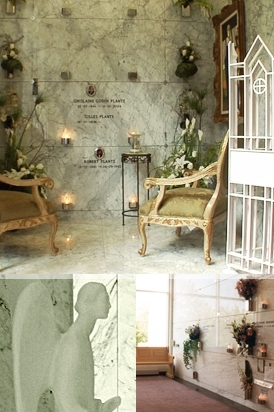 The casket is placed in a crypt, also called a funerary recess, which is a space built into a wall, sealed, then covered with a white marble plaque, with an inscription of the deceased. In addition to providing individual and double spaces, the Saint Martin mausoleum has familial chapels that can hold up to 14 crypts. Color photos on ceramic tiles, memorial candles and engraving are included in the purchase price.